Sorry I’ve missed a few weeks–had to take care of some business on the ground. So here is where we stand: According to a poll published on Friday, August 29, Marina Silva became the favorite to win the presidential election. This was a shocker. In the first poll taken after after the death of her running mate, presidential candidate Eduardo Campos (Marina was vice candidate), Marina placed second, barely ahead of Aecio Neves (PSDB). 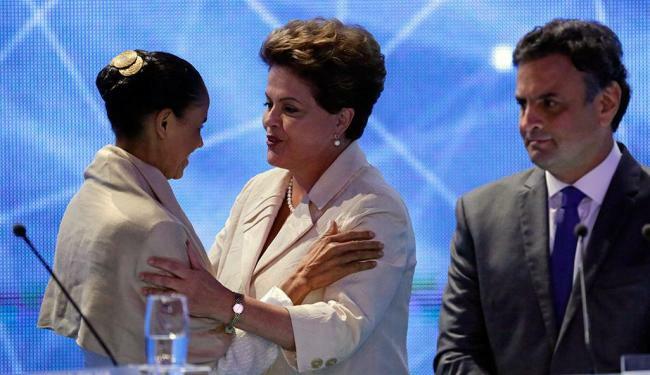 But by the end of August she was tied with President Dilma Rousseff in first place. 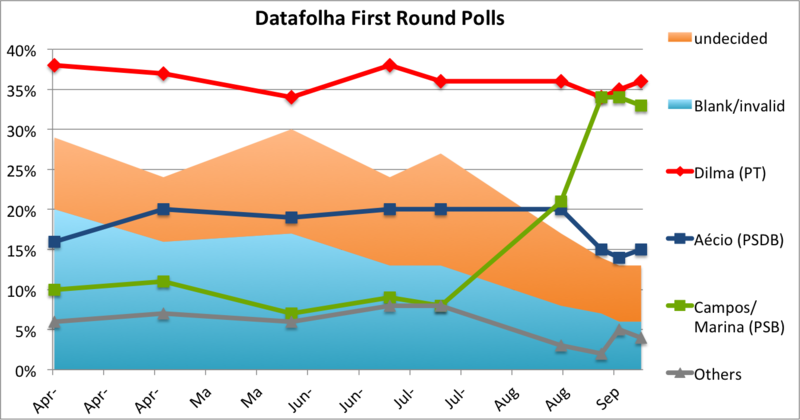 Since then, two more Datafolha polls were taken, showing the race stabilizing, with a slight advantage opening up for Dilma, the incumbent. These particular polls simulate the first round. In Brazilian presidential elections, if no candidate wins 50 percent of the vote in the first round, the top two finishers compete in a two person, second round vote. In simulations of the second round, where the election will ultimately be won or lost, Marina was clearly ahead of Dilma in August (50 to 40 percent). Since then, however, the incumbent has gained ground. As of September 9, the race was a technical tie with Marina being ahead 47 to 43 percent, just within the margin of error. Pincers closing in – the new and the old race. We seem to be observing two momentum shifts in close succession. Marina soared following the Campos tragedy, but gravity may have kicked in, and she could be on her way back down to earth. Meanwhile, the Dilma campaign needed some time to rearrange their artillery from their expected opponent, Aécio Neves and the PSDB, to Marina, a much less defined target. By early September however, Dilma’s PT was ready and firing from all angles. They are clearly taking advantage of her air superiority (Dilma is afforded 11.5 minutes of national TV time nightly, versus Marina’s 2 minutes). A recent PT commercial actually drew a comparison between Marina and two other “outsider” presidents elected in Brazil’s history: Jânio da Silva Quadros and Fernando Collor de Mello. Both of these presidencies ended in disaster. However, Marina’s gravest wound was self-inflicted. She flip-flopped (havaianad?) on a key issue. On Friday, August 29 the Marina campaign published their full and comprehensive campaign program. One item receiving significant attention was the endorsement of full marriage equality. Marina’s evangelical constituency–a group staunchly opposed to gay marriage–was not thrilled. So the next day, Saturday August 30, Marina announced that the endorsement of gay marriage in the program was due to an editorial mistake and that her position remained in favor of civil unions but opposed to full gay marriage. This is big for two reasons. First, flip-flopping, or backtracking from a previously pronounced position is always a bad idea in electoral politics. 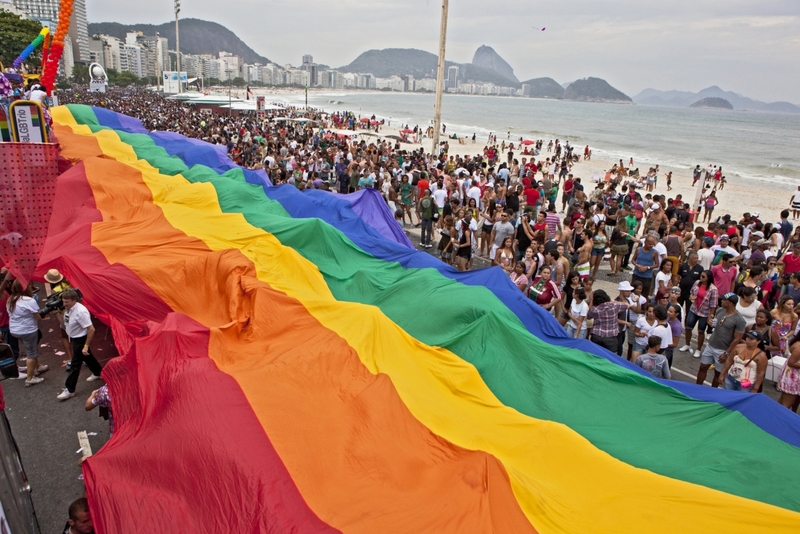 Second, the issue on which she flip-flopped, gay rights, matters to a significant share of Marina’s base: young, well-educated urban Brazilians. The same people who are fed up with “old politics” in Brazil and that are attracted to Marina’s environmentalist approach also care about gay marriage. Her flip-flopping may gain her some support on the evangelical side, but evangelical voters were unlikely to vote for Dilma (a feminist and somewhat of a closeted social liberal). For the LGBT community and their supporters, now Dilma seems like the best hope – so they might just grind their teeth and vote for her again. She backtracked on them, will they have second thoughts about her? So where does the race stand now? It’s essentially a two-women race. 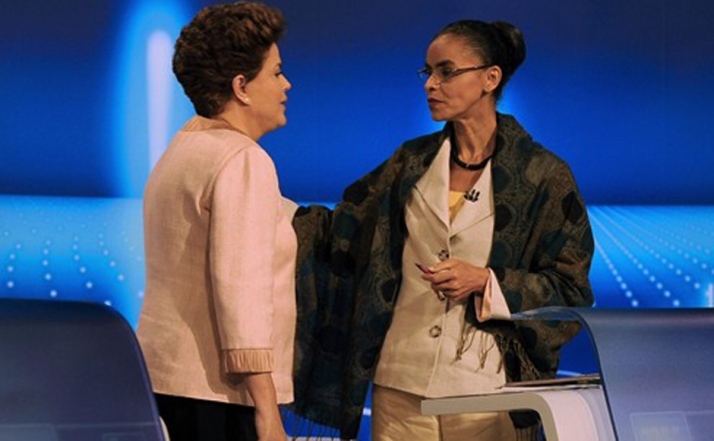 According to the polls, Dilma and Marina are close in the first as well as second round. Aécio Neves is far behind in the first round polls and still clearly lagging Dilma in the second round simulations. It will be hard for him to catch up in the few days remaining. The battle between Dilma and Marina and their respective supporters is becoming increasingly fierce. For the first time the PT is feeling it could actually lose and they will do anything to prevent that. At the same time, the anti-Dilma vote is likely to unite increasingly behind Marina. We are less than three weeks away from the first round and six from the second round. A lot could still happen. For example, there is a major corruption scandal brewing and it implicates many Dilma allies, alleged to have siphoned off millions from excessive payments made by the state oil company Petrobras. Brazilian voters have seen plenty of corruption scandals, so it is not clear this one will make a difference. But if evidence were to emerge tying President Rousseff to the wrong doing, this could be a game changer. So for now, sit tight and enjoy the show. João Schlüter is a Brazilian political analyst and insider. This entry was posted in Brazil, Uncategorized and tagged Aécio Neves, Brazil, campos, Datafolha, dilma, election, Marina Silva, PSDB, PT, who will win Brazilian election. Bookmark the permalink. Wow, this is by far the best summary of the political climate in Brazil. You are a fantastic writer and journalist. This blog is fantastic. I’m still not sure where my vote’s headed for the second round, but I really wouldn’t like Marina to win. I’m one of those people hurt by her flip-flopping. It shouldn’t be something that affects my whole vote, I know, but it’s hard not to think again when it’s about being able to be with who you love however you want to. Religion should not have a weight on that. Well, anyway… It’s a party! Muito obrigado Cláudio! I think one thing many outside observers fail to appreciate is the fact that the election is about much more than just the economic scenario. Social issues, public safety, corruption, all these things play an important, maybe more important role. The next few weeks will be extremely interesting.